Line Up Early on Tuesday Night! We Close at 8PM and Re-open at Midnight Wednesday AM! 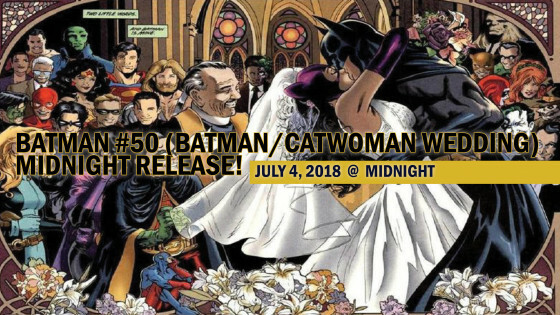 BATMAN #50 (Batman / Catwoman Wedding Issue) Midnight Release! MIDNIGHT 7/4 CC Parkville Only! That's Right, Collectors Corner Parkville - HQ Location Only will be celebrating the Release of BATMAN #50 at Midnight on Tuesday/Wednesday 12 Midnight - 2AM. ALL NEW Comics & Subcription Boxes will be Availble for Sale at Midnight, get them before we Re-Open on Wednesday. First Chance to Own ALL 3 BATMAN #50 Comic Book Covers, we'll have them ALL! Regular Cover, Arthur Adams & Jim Lee Covers Available. *30% Off All Batman & Batman Family Graphic Novels and Single Issues, Back Issues not Dated within 30 Days.